Arjohuntleigh portable ceiling track lift unit allows for multiple room usage, weighs only 14.3lbs, 440 lb lifting capacity. The Maxi Sky 440 is highly suitable for care facilities that want to gain the benefits of ceiling lifts on a limited budget. 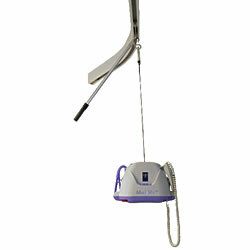 The portable ceiling lift allows a single caregiver to perform transfers under handset control without stress or strain and with no manual lifting. Weighing just 14.3 lbs, the compact lift cassette with folding sling hooks and integrated carry handle is very easy to move from room to room. Portability does not mean compromising on capacity. The Maxi Sky 440 can lift up to 440 lbs, making it ideal for transferring most non-ambulatory residents. The Tarzan hook feature allows the "swing" transfer of both lift cassette and resident directly from one track to another. Room to room track transfers can be performed without modifying doorways. Controls are easily accessible on the handset or the front of the lift cassette. Features such a brake, manual lowering system and stopping device – safeguard the resident in the event of an emergency. The versatile track system can be optimized to deliver the most efficient solution for a specific working space. The unit is always ready for use. It is simply connected via a cord to a convenient power outlet for recharging. Immediate electronic soft-start and soft-stop means there are no delays or "overrun", ensuring the lift can always be stopped exactly in the required position. The Maxi Sky 440 system offers a wide range of possible installations and functions. A freestanding gantry (Easytrack FS) is an optimal solution when a permanent track is not required. The lightweight aluminum gantry is easy to assemble – just snap the parts together – and a simple, built-in alignment scale ensures correct positioning of the gantry legs. Installation of a permanent track layout, which can also feature turntables and the x-y system, is far faster than conventional methods due to the revolutionary patented design of the KWIKTRAK brackets. This portable ceiling lift combines the key features of a fixed system with the benefits of maximum flexibility. Weighing just 14 lbs / 6.35 kg, the compact lift cassette, with its folding sling hooks and integrated carry handle, is very easy to move from room to room. However, portability does not mean compromising on capacity. The Maxi Sky 440 can lift up to 440 lbs / 200 kg, making it ideal for transferring most non-ambulatory residents. Maxi Sky 440 can be used for everyday patient handling tasks including toileting. This routine can be performed in a very simple and dignified way with the resident comfortably supported by a toilet sling. Shown above is a smooth transfer from a wheelchair to the toilet using a gantry (Easy Track FS). Controls are easily accessible on the handset or the front of the lift cassette. The electronic soft-start and soft-stop makes it easy for the caregiver to ensure the lift can always be stopped smoothly and safely, exactly in the required position. a screwdriver. A red light on the lift cassette alerts the caregiver when servicing is required. The modular design means replacement components can be simply snapped into place. Strap length up to 88"
Unit weight (batteries included): 14 lbs. Strap length: up to 88"
Batteries: 2x2.3 Ah will average 2 to 4 hours to a complete charge or 30 transfers at 176 lbs.